Refer to Wiring Diagrams Cell 130 , Radio for schematic and connector information. 1. Verify the customer concern by operating the electronic audio system with the engine running. 2. Visually inspect the following for obvious signs of mechanical and electrical damage. 3. If the concern remains and the fault is not detected, proceed to the Symptom Chart to continue diagnostics. REMOVE the audio unit and SEND it to an authorized Ford audio system repair facility. TEST the system for normal operation. FM signal out of range. INFORM customer of methods for obtaining best reception. Is the audio unit display illuminated? Verify that sound is coming from all the speakers. Is there sound coming from all the speakers? System operation is normal at this time. REMOVE the audio unit and SEND it to an authorized Ford audio system facility. Refer to the owner literature for audio system controls. Verify that the controls and features operate correctly. Do the controls and features operate correctly? REPAIR the circuit (s) in question. TEST the system for normal operation. Measure the voltage between the audio unit C290b pin 10, circuit 1002 (BK/PK), harness side and ground, and between the audio unit C290b pin 9, circuit 828 (VT/LB), harness side and ground. CLEAN and SECURE the antenna connections as necessary. TEST the system for normal operation. Check the antenna connections including the extension cable. Check to make sure the antenna is securely mounted to the vehicle body at ground points. Check the radio receiver hood bonding strap and the body-to-chassis straps for integrity, cleanliness, and metal-tometal contact. NOTE: The capacitor mounting points are used to complete the electrical circuit and must be mounted securely to clean surfaces. Check the mounting and connecting circuits of the radio ignition interference capacitor for integrity, cleanliness, and metal-to-metal contact. Are the connections clean, secure, and in metal-to-metal contact? INSTALL a new radio ignition interference capacitor. TEST the system for normal operation. Check the operation of the radio ignition interference capacitor by substituting it with a known good component. Turn the audio unit on and check the radio reception. INSTALL a new generator. REFER to Section . TEST the system for normal operation. Check the generator by disconnecting the wiring from the voltage regulator. Turn on the audio unit and check the radio reception. REPAIR the ignition system as necessary. TEST the system for normal operation. Check the ignition circuits for correct routing, grounding, and integrity of connections. Are the ignition components OK? INSTALL a new antenna. TEST the system for normal operation. Substitute a known good antenna. Ground the antenna base to an unpainted metal surface on the vehicle. Verify the operation of the audio unit. INSTALL a new antenna cable. TEST the system for normal operation. Substitute a known good antenna cable. REMOVE the audio unit and SEND it to an authorized Ford audio system repair facility. Substitute a known good audio unit. REMOVE the subwoofer amplifier and SEND it to an authorized Ford audio system repair facility. Substitute a known good subwoofer amplifier. Permanently REPOSITION the components as needed. TEST the system for normal operation. GROUND various parts (for example, engine, fenders, quarter panels, stone deflectors, body sheet metal) of the vehicle to the frame using a jumper cable. When noise is eliminated, PROVIDE a permanent ground where necessary. TEST the system for normal operation. Determine if the noise can be eliminated by repositioning the antenna cable, speaker circuits, or audio unit power feed circuits away from other circuits or brackets. Operate the SEEK/SCAN functions with the audio unit in both AM and FM tuner modes. Do the SEEK/SCAN functions search continuously? Measure the resistance between the antenna cable lead terminal and the end of the antenna grid wire. Is the resistance less than 8 ohms? INSTALL a new antenna extension cable. REFER to Section. TEST the system for normal operation. REINSTALL the original cable. REMOVE the audio unit and SEND it to an authorized Ford audio system repair facility. TEST the system for normal operation. Substitute a known good antenna cable between the audio unit and the antenna. Check the operation of the audio unit. For convertible, GO to D2 . For coupe, GO to D4 . For Mach 1000 subwoofer speakers,GO to D8 . Are all speakers without sound? REPAIR the circuit (s) in question. Are the resistances less than 5 ohms between the subwoofer amplifier and the affected speaker(s) and greater than 10,000 ohms between the subwoofer amplifier and ground? Are the resistances less than 5 ohms between the subwoofer amplifier and the audio unit and greater than 10,000 ohms between the subwoofer amplifier and ground? Are the resistances less than 5 ohms between the subwoofer amplifier and affected speaker(s) and greater than 10,000 ohms between the subwoofer amplifier and ground? Measure the resistance between the subwoofer amplifier C4109b pin 5, circuit 169 (LG/BK), harness side and the audio unit C290a pin 6, circuit 169 (LG/BK), harness side and between the subwoofer amplifier C4109b pin 5, circuit 169 (LG/BK), harness side and ground; and between the subwoofer amplifier C4109b pin 6, circuit 172 (LB/RD), harness side and the audio unit C290a pin 5, circuit 172 (LB/RD), harness side and between the subwoofer amplifier C4109b pin 6, circuit 172 (LB/RD), harness side and ground. INSTALL a new speaker. TEST the system for normal operation. Substitute the affected speaker with a known good component. Is the affected speaker(s) operational? SEND the audio unit to an authorized Ford audio system repair facility. Substitute the affected audio unit with a known good component. Disconnect: Mach 1000 Affected Subwoofer Amplifier. Measure the voltage between affected subwoofer amplifier pin 5, circuit 828 (VT/LB) (left amplifiers) and ground, or between pin 5, circuit 829 (WH/VT) (right amplifiers) and ground. NOTE: Ground circuit 694 is located in the same cavity in all four subwoofer amplifiers. 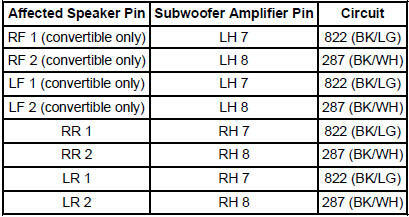 Measure the resistance between affected subwoofer amplifier pin 2, circuit 694 (BK/LG) and ground. 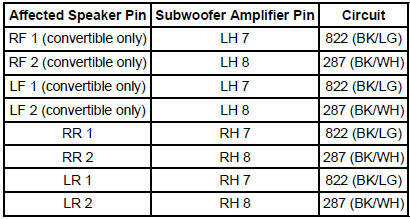 NOTE: Audio signal circuits 169 and 172 are located in the same cavity on all four subwoofer amplifiers. Turn on the audio unit and check for a fluctuating AC voltage between affected subwoofer amplifier pin 8, circuit 172 (LB/RD) and pin 7, circuit 169 (LG/BK). Does the voltage vary as the volume is adjusted? Is the resistance less than 5 ohms between the audio unit and subwoofer amplifier and greater that 10,000 ohms between the subwoofer amplifier and ground? INSTALL a new subwoofer speaker. Disconnect: Affected Subwoofer Speaker . Turn on the audio unit and check for a fluctuating AC voltage between affected subwoofer as follows: For right subwoofer pin 4, circuit 187 (DB/OG) and pin 2, circuit 189 (LG/BK) harness side; and between pin 3, circuit 179 (OR/RD) and pin 1, circuit 176 (PK/LG) harness side. For left subwoofer pin 1, circuit 187 (DB/OR) and pin 3, circuit 189 (LG/BK) harness side; and between pin 2, circuit 179 (OR/RD) and pin 4, circuit 176 (PK/LG) harness side. INSTALL a new subwoofer amplifier. Disconnect: Respective Amplifier to Subwoofer Speaker Connector. Is the resistance less than 5 ohms between the amplifier and subwoofer speaker and greater that 10,000 ohms between the subwoofer speaker harness and ground? Turn the audio unit on. Does the audio unit display illuminate? Check the operation of all speakers. For convertible, GO to F2 . For coupe, GO to F4 . For Mach 1000 subwoofer speakers,GO to F6 . Carry out the speaker walk-around test by pressing preset buttons 3 and 6 simultaneously. Do all speakers have poor sound quality? NOTE: Audio signal circuits 169 and 172 are located in the same cavity on all four subwoofers. Is the resistance less than 5 ohms between the audio unit and subwoofer amplifier harness and greater that 10,000 ohms between the subwoofer amplifier harness and ground? Is the sound quality OK? Is there poor quality or distortion in all speakers? For convertible, GO to H2 . For coupe, GO to H6 . For Mach 1000 subwoofer speakers,GO to H10 . Turn on the audio unit and listen for correct subwoofer operation. Disconnect: LH Subwoofer Amplifier C4108a. Disconnect: RH Subwoofer Amplifier C4109b. Measure the voltage between the subwoofer amplifiers pin 4, circuit 828 (VT/LB), harness side and ground; and between the subwoofer amplifiers pin 5, circuit 828 (VT/LB), harness side and ground; and between the subwoofer amplifiers pin 6, circuit 828 (VT/LB), harness side and ground. Measure the voltage between the LH subwoofer amplifier C4108b pin 2, circuit 173 (DG/VT), harness side and ground; and between the RH subwoofer amplifier C4109b pin 2, circuit 174 (GY/BK), harness side and ground. Does the audio unit operate correctly? Measure the voltage between the subwoofer amplifier C4109b pin 5, circuit 828 (VT/LB), harness side and ground; between the subwoofer amplifier C4109b pin 6, circuit 828 (VT/LB), harness side and ground; and between the subwoofer amplifier C4109b pin 7, circuit 828 (VT/LB), harness side and ground. Measure the resistance between the subwoofer amplifier C4109b pin 1, circuit 694 (BK/LG), harness side and ground; between the subwoofer amplifier C4109b pin 2, circuit 694 (BK/LG), harness side and ground; and between the subwoofer amplifier C4109b pin 3, circuit 694 (BK/LG), harness side and ground. With the audio unit turned on, measure the voltage between the subwoofer amplifier C4109b pin 2, circuit 173 (DG/VT), harness side and ground. Measure the voltage between affected amplifier harness pins 1 and 2, circuit 828 (VT/LB) (left amplifiers) and ground, and between pins 4 and 5, circuit 829 (WH/VT) (right amplifiers) and ground. Measure the resistance between subwoofer amplifier pins 2, circuit 694 (BK/LG) and ground. If the loud pops are from the convertible LH subwoofer amplifier only, REPAIR circuit 173 (DG/VT). TEST the system for normal operation. Listen to see whether the loud pops are from the LH or RH subwoofer amplifiers for the convertible. Are the pops from both subwoofer amplifiers for the convertible?